Want to Play Skip Bo Online!? Click to get this game! + The absolutely best way to play Skip Bo on your computer! + You get to play Skip Bo online as part of your FREE trial sign-up — AND keep the full PC game FREE! 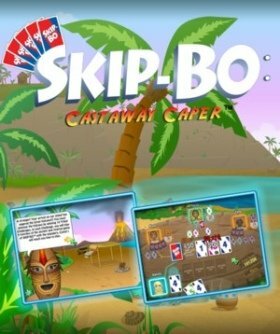 Get the Amazing Skip Bo Castaway Caper today! 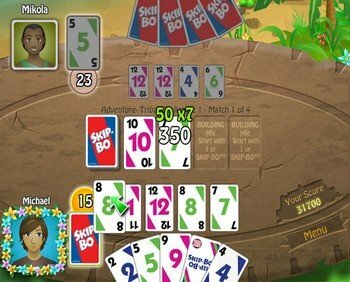 is a very addictive one-player version of the card game Skip Bo. It may seem like a game of chance at first glance, but there’s actually a significant amount of skill involved. After a cute Skip Bo card loading screen, you’ll divert to customizing a character. You’ll first play Mr. Tiki Man in a tutorial game; Castaway Skip Bo plays just like regular Skip Bo, and you should whoop him pretty fast. At the end of the tutorial you will unlock Classic, Speed and Team Skip Bo. The modes outside of Adventure are all pretty easy to describe. With Classic, you can select up to three computer players and three difficulties to play the regular game for fun. Team will have you paired with an AI; cards are shared and can be used freely by both contenders (you both have to go out to win). Get the Amazing Skip Bo Castaway Caper! Speed is just a diet version of Classic Skip Bo, providing ten cards in your stock pile instead of the usual thirty (the number of cards in the stock pile is continuously displayed). 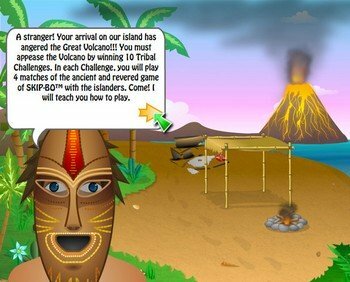 Your turn is always up first in Castaway Caper. Adventure is the place to earn achievements and play different types of Skip Bo throughout your quest. You partake in a series of Tribal Challenges (Skip Bo games) in this mode. The computer players move at a good pace, sometimes causing you to forget that you need to be staying on top of what’s in their hand too so you can block. You score combo multipliers for laying down a bunch of the pastel cards at once. Your hand is automatically refreshed to five at each new turn, and discard piles are similarly created automatically as soon as you store an unneeded card. You can have up to four discard piles. Each game ends with a statistics screen. Halfway through a set of matches, a new Skip Bo deck will be awarded if you are successful at a mini-game. There are ten to unlock in all from a Pineapple deck to Bamboo, so happy playing! Skip Bo Castaway Caper is pure fun for those who aren’t afraid of card games. It features relaxing and catchy music in addition to its island settings. It’s excellent for playing Skip Bo games by yourself. 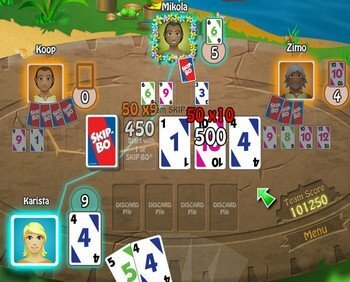 Play Skip Bo online AND get the Amazing Skip Bo Castaway Caper now! The graphics remind me of construction paper, but they aren’t horrible. You also have to be careful not to put the card you want to play in one of your store heaps by accident, as they are positioned very close to the main playing area. The computer personas are too easy in Adventure mode. Skip Bo Castaway Caper is a must for those familiar with the traditional card game. Even if you’re new to Skip Bo, it’s likely you’ll fall in love with its “Stock” market. Comments for Play Skip Bo Online! does no one have the original Skip Bo card game online?!!! i like it but it needs to have more levels but other than that it awesome. Jan 16, 2012 love it! Wow, I really like this game. I had the card version but never played it. Nov 11, 2010 Omline skip-bo! have skip-bo at my house,I play It with my family,my friends,and even my cosins. This game is off the hook!!!!!!!!!!!!!!! love the game, just a shame that when playing it on line, you can only play a couple of games before being asked to buy it. ITS AWESOME AND FUN PLAY IT PLAY IT YOU WONT REGRET IT I PLAY EVERY TIME I COME OVER TO MY COUSINS HOUSE EVRY NIGHT IM ALWAYS UP UNTIL LATE AT NIGHT JUST TO PLAY IT SPECTACULAR! Kewlioo!!! i love this game! OMG! I can’t believe i found it online!!! i hadnt played in years!!!! That’s sad that Paypal Plugin is no longer available. However, from the post office and many other outlets, you can buy a Visa Gift Card. These are just like regular Visa cards that work a bit like phone cards. Once your balance is used, they are no longer valid and you will need to buy a new one. They would work fine for this promotion. You can get your free download and anybody can own a Visa gift card. Read more about Visa gift cards. Jun 09, 2010 We have no credit card!! No credit card you get no download,As for the paypal addon that is no longer valid!!!! We Do have a debit card!!! AwEsOmE gAmE n CuSsIn DoN mAkE u KeWl K?! AlRiGhT?! oK sO jUs PlAy ThE fReAkIn GaMe! First of all, you CAN get this game free even if you don’t have a credit card. 1) If you have a Paypal account, you can use Paypal Plugin. This simulates a credit card from your Paypal balance. 2) You can buy Visa gift cards from places like the post office, as well as online. These act just like regular Visa cards. Both will let you sign up for GameHouse and get your free game. So stop whining. THIS GAME is the best game I ever played .Every time I get home I play this game online first then I play it on tv.You can only play on tv if your parents have direct tv.ANYWAYS whoever hasn’t played this game they need to play it. Oct 09, 2009 can u bleeve it? when are we going to play skip bo on the computer. Jul 11, 2009 Great for learning. Is there a site available to play with real people? the game skip-bo is very good. can i play this game without a creditcard??? i don’t have wone!!! Jun 18, 2009 The Best!!!!!!!!!!!!!!!!!! May 10, 2009 skipBo the best!